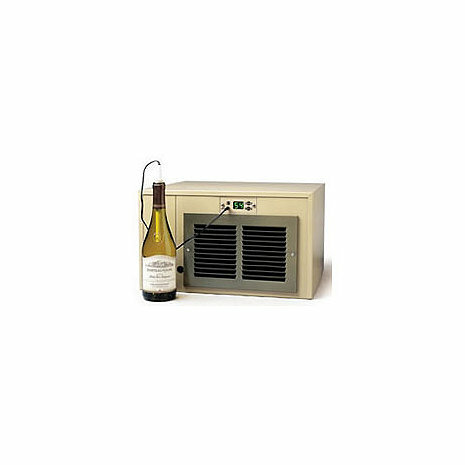 Your valuable wine collection deserves a dependable, efficient, state-of-the-art cooling system. Your budget deserves something affordable. Breezaire takes care of both. The WKCE Series cooling units are a compact design with cold air discharge on the bottom, which makes them ideal for installation in cabinets. Because of their configuration the WKCE series cooling units are not rated for specified number of cubic feet. They are intended for cabinets and other constricted enclosures. Ask your Breezaire Dealer for details. Large, easy to read, green LED display. Accurate, easy to adjust, readable set points with continuous reading of enclosure temperature or displaying of set point when changing enclosure temperatures. Power outage protection, which delays units start up after power outages. Blocked airflow protection, which shuts down the unit and protects your wine in case of high temperatures caused by condenser blockage. Controls temperature by enclosure air sensors or optional bottle probe. Mounts easily through your wine cellar wall and vents to an adjacent room. Venting space must be as big or larger than you wine cellar. Your cellar must be properly insulated and vapor sealed for the unit to cool properly. For further descriptions and comparisons, please call 800-377-3330 for a free consultation with one of our wine storage specialists.